delicious. magazine celebrates food and the people who produce it, from emerging and established chefs, to passionate ?foodies? from around Australia and the rest of the world. Food is life. Make it delicious. Subscribe today and get every issue conveniently delivered free to your door.Delicious magazine includes a double December/January issue. Be the first person to tell us what you think about delicious. 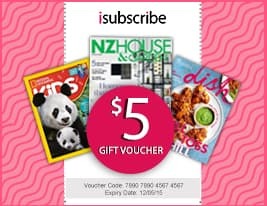 (AU) and you'll save $5 on your next purchase!